At Bunch Auctions, a combined sale of Rare Books & Fine Prints and Native American Artifacts. A first edition of Dickens’ A Tale of Two Cities, with a tipped-in Dickens letter to Ticknor & Fields and other extra material included, is expected to lead the way at $18,000-26,000. Also to be had are a first issue of Oliver Twist ($8,000-10,000) and a number of other important Dickens lots, as well as a 1681 William Penn indenture ($4,000-6,000). Books and Manuscripts, in 216 lots, will be sold at Il Ponte in Milan. A few highlights are expected to include a copy of La Pérouse’s Voyage (1797) and a 1478 Venice edition of Pomponio Mela’s Cosmographia, both estimated at €6,000-9,000; a Hebrew book in a silver binding is estimated at €3,000-5,000, and a modern fascimile portolan chart (c.1960) based on a sixteenth-century Italian original could fetch €5,000-8,000. Morton Subastas sells Mexican Historical Documents and Books, in 230 lots. George Wilkins Kendall’s 1851 work The War Between the United States and Mexico is estimated at $350,000-400,000. A reissue of the collection of lithographs published as México y sus Alrededores, originally published in 1855, could sell for as much as $150,000-200,000. Mateo Ximénez’s book of engravings depicting the life of Sebastián de Aparicio y del Prado (Rome, 1789) is estimated at $100,000-120,000, as is a copy of Lorenzana’s Historia de la Nueva España (Mexico City, 1770). An album containing photos and autographs of Mexican actresses of the early twentieth century is estimated at $50,000-60,000. On Wednesday, January 23, University Archives sells Autographed Documents, Manuscripts, Photos & Books, in 260 lots. Handwritten and signed lyrics to Bob Dylan’s “Like a Rolling Stone” are estimated at $50,000-60,000, and a 1786 letter from John Paul Jones to Thomas Jefferson (as American minister to France) could sell for $24,000-26,000. What is described as the longest J.D. Salinger autograph letter ever offered at auction ($8,000-9,000) will also be up for grabs. Also on Wednesday, Rare Books & Works on Paper at Chiswick Auctions, in 337 lots. PBA Galleries sells a Mid-Winter Miscellany Part II, with Illustrated and Children’s Books, on Thursday, January 24. Prices are mostly expected to be in the three-figure range for this 377-lot sale, and lots from 249 through the end are being sold without reserve. Rounding out the week’s sales is Thursday’s Fine Manuscript and Printed Americana auction at Sotheby’s New York. The 189-lot sale caps Americana Week at the auction house and contains a huge number of very impressive items. Rating the top presale estimate, at $800,000-1,200,000, is a copy of the extremely rare broadside announcing the American ratification of the Treaty of Paris, printed by John Dunlap at Annapolis in early 1784 (pictured). This is just one of two known copies featuring the embossed seal of the United States and signed by both the President and Secretary of Congress. A copy of the 1823 Stone facsimile of the Declaration of Independence on vellum, inscribed by John Quincy Adams to Thomas Emory--then serving as the President of Maryland’s Governor’s Council--is described by Sotheby’s as the only known copy in private hands to have passed by descent from the original recipient; it is estimated at $600,000-800,000. A fascinating 1757 letter from George Washington to Virginia governor Robert Dinwiddie about the rights of British Americans could fetch $300,000-400,000, while a copy of the first book printing of the Declaration of Independence in a sammelband volume with other important Revolutionary War pamphlets is estimated at $300,000-500,000. At Bunch Auctions, a combined sale of Rare Books & Fine Prints and Native American Artifacts. A first edition of Dickens' A Tale of Two Cities, with a tipped-in Dickens letter to Ticknor & Fields and other extra material included, is expected to lead the way at $18,000-26,000. Also to be had are a first issue of Oliver Twist ($8,000-10,000) and a number of other important Dickens lots, as well as a 1681 William Penn indenture ($4,000-6,000). Books and Manuscripts, in 216 lots, will be sold at Il Ponte in Milan. A few highlights are expected to include a copy of La Pérouse's Voyage (1797) and a 1478 Venice edition of Pomponio Mela's Cosmographia, both estimated at €6,000-9,000; a Hebrew book in a silver binding is estimated at €3,000-5,000, and a modern fascimile portolan chart (c.1960) based on a sixteenth-century Italian original could fetch €5,000-8,000. Morton Subastas sells Mexican Historical Documents and Books, in 230 lots. George Wilkins Kendall's 1851 work The War Between the United States and Mexico is estimated at $350,000-400,000. A reissue of the collection of lithographs published as México y sus Alrededores, originally published in 1855, could sell for as much as $150,000-200,000. Mateo Ximénez's book of engravings depicting the life of Sebastián de Aparicio y del Prado (Rome, 1789) is estimated at $100,000-120,000, as is a copy of Lorenzana's Historia de la Nueva España (Mexico City, 1770). An album containing photos and autographs of Mexican actresses of the early twentieth century is estimated at $50,000-60,000. On Wednesday, January 23, University Archives sells Autographed Documents, Manuscripts, Photos & Books, in 260 lots. Handwritten and signed lyrics to Bob Dylan's "Like a Rolling Stone" are estimated at $50,000-60,000, and a 1786 letter from John Paul Jones to Thomas Jefferson (as American minister to France) could sell for $24,000-26,000. What is described as the longest J.D. Salinger autograph letter ever offered at auction ($8,000-9,000) will also be up for grabs. PBA Galleries sells a Mid-Winter Miscellany Part II, with Illustrated and Children's Books, on Thursday, January 24. Prices are mostly expected to be in the three-figure range for this 377-lot sale, and lots from 249 through the end are being sold without reserve. Rounding out the week's sales is Thursday's Fine Manuscript and Printed Americana auction at Sotheby's New York. The 189-lot sale caps Americana Week at the auction house and contains a huge number of very impressive items. 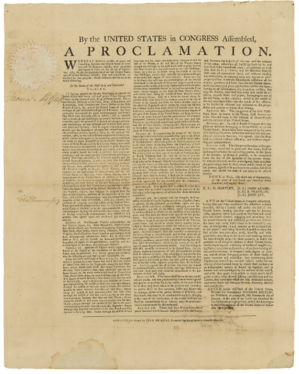 Rating the top presale estimate, at $800,000-1,200,000, is a copy of the extremely rare broadside announcing the American ratification of the Treaty of Paris, printed by John Dunlap at Annapolis in early 1784 (pictured). This is just one of two known copies featuring the embossed seal of the United States and signed by both the President and Secretary of Congress. A copy of the 1823 Stone facsimile of the Declaration of Independence on vellum, inscribed by John Quincy Adams to Thomas Emory--then serving as the President of Maryland's Governor's Council--is described by Sotheby's as the only known copy in private hands to have passed by descent from the original recipient; it is estimated at $600,000-800,000. A fascinating 1757 letter from George Washington to Virginia governor Robert Dinwiddie about the rights of British Americans could fetch $300,000-400,000, while a copy of the first book printing of the Declaration of Independence in a sammelband volume with other important Revolutionary War pamphlets is estimated at $300,000-500,000.